I have not seen them in a while. The last times were when they claimed that at a signal from him the economy of Catalonia would stop ( Junqueras ). Or that the streets would be permanently occupied if the government prevented their plans ( Sánchez ). Or that it was time to go for all ( Romeva ). Sic. Thinking of a prisoner is a bad thing. These will have risen at dawn in an inhospitable cell. They will have breakfast like the one that is injected. Then the waits, syncopated, endless. The dawn very cold, blunting. And the van, which is a somewhat roundabout way of traveling. The room is filled with family and friends, and they do not stop smiling, courageous. Apart from the reunion is the adrenaline of the day that has finally arrived. 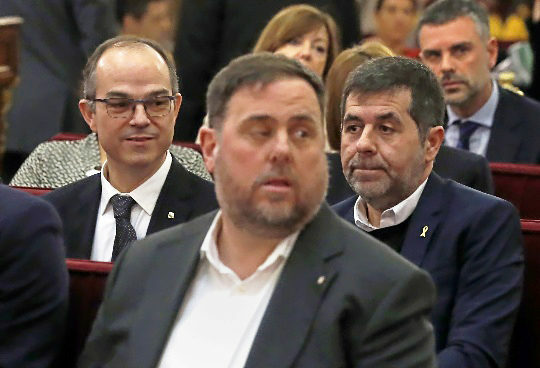 The prisoner Junqueras abstains notoriously from smiles and more or less complicit gestures. He has opted for hieratism. If there was a sportswriter, I would say that he wants to hold the sky with his back. Well, throw the game over, I say. Junqueras appreciates that delicate moment of the man in which the Atlantean begins to dictate his behavior. A prisoner is a bad thing because next to his condition, his indisputable helplessness, is the damage he has caused. Sometimes the damage is obvious and hurtful. There is a corpse. An empty safe. A woman raped. The damage done by the nationalist prisoners is of another order. Luckily there is not a single dead person. The Process cost an eye of the face and an egg. Much for those who lost them, but little price when faced with the freedom of a people, you will see. However. How not to award these prisoners the incurable rupture of coexistence in Catalonia. The incalculable embezzlement of public money and time. The erosion of Spanish democracy, that is, of the rights of the Spaniards, to which they devoted themselves in a smiling and sustained manner. Some of the lawyers considered in the first session of the trial that the right to the presumption of innocence of their clients has been violated in the Spanish public conversation. It is probable. And the reproach is fair. The problem is that it addresses people who, so to speak, contemplated a crime with the pleonasm of their own eyes. And not two, four or ten people. To millions. Myself. I saw on October 27, 2018, shortly after five o'clock in the afternoon, how the Forcadell dam read the declaration of independence of Catalonia before the deputies who would approve it minutes later. I saw autonomous police stationed in the places of illegal voting on October 1, in violation of the orders of the Prosecutor's Office that forced them to prevent the ceremony. I saw the crowd, encouraged by the highest political authorities of Catalonia, to prevent with its force that the national police comply with the judicial orders that the autonomous police were not fulfilling. What does it mean, by the way, and regarding the illegitimate force, that the prisoner Sánchez declared before that day in October that if the polls do not speak, would he speak the street? It is false to argue that the Spanish State opened a General Cause against the separatism that concludes with this trial, as one of the lawyers said yesterday and is a recurrent recurrence in the strategy of some defenses. The independence movement operated with total calm in Catalonia and in the rest of Spain while their movements were in accordance with the law. But, at the same time, it is impossible to judge the events of October if they do not register in a General Cause against the Process. The purpose of the Process was to declare the independence of Catalonia, with the law or against the law. And in a sustained action of several years mobilized a remarkable number of people and resources, always under the direction of the Catalan political authority, which never obeyed the masses, but framed them, in a succession of beautiful populist effects. The profound question of this trial is not whether the facts related by the accusation are true. The question is how will Spanish democracy decide to punish them.